The first authorized guided Sleeping Bear kayak trips in Sleeping Bear Dunes National Lakeshore will begin in summer of 2016, offered by All About Water, a kayak rental and guide service. Company owner Jeff Gagie expects to conduct final kayak guide training and dial in trip logistics during May and be well prepared to offer the guided kayak trips in Sleeping Bear for the kickoff of tourist season. 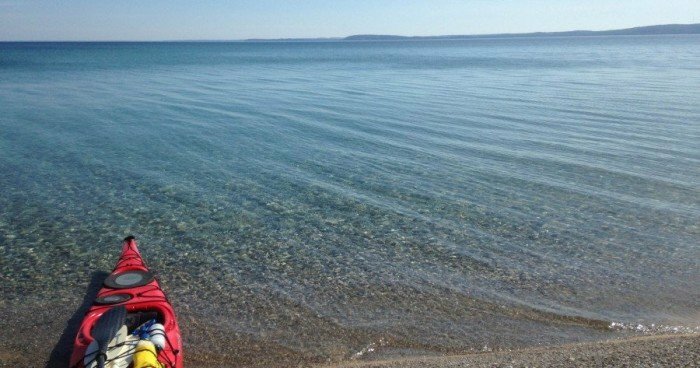 Gagie has spent a good deal of time on the Lake Superior shore near Pictured Rocks National Lakeshore and borrowed the idea of guided kayak trips in Sleeping Bear Dunes from outfitters he saw in action there. “It’s just a very pleasing way to spend the day, out on the water in a kayak, and I thought it would work here too,” he says. The daily trip schedule will naturally vary according to wind and weather, but Gagie expects one popular trip to involve launching at Empire or North Bar Lake and paddling north along the face of the Sleeping Bear Dunes, around Sleeping Bear Point and taking out at Glen Haven, about a 6-mile trip. Another popular trip would entail putting in on the western flank of Pyramid Point and paddling north and east around the point and into Good Harbor Bay. If the winds are too great on a given day, Gagie expects to have options ready for smaller inland lakes and rivers. Gagie must meet safety standards for the U.S. Coast Guard and the Leelanau Sheriff Department in addition to requirements set forth by the National Park. “People are naturally concerned about impact on the park,” Gagie says. “I understand that, because I’m concerned about that too. This is a beautiful place, it needs to be respected and appreciated.” One example of a measure Gagie’s company must take: guides must carry a portable bathroom device so if a client needs to defecate, the device is used and the waste is removed from the park. The park limits the number of kayaks to 12 during a given trip, but there is currently no limit on the number of trips that All About Water can launch on a given day. The outfitter will provide all gear needed for the trips, including kayaks, life jackets, paddles, dry bags, and wetsuits if conditions require. Information and reservations at allaboutwaterusa.com.